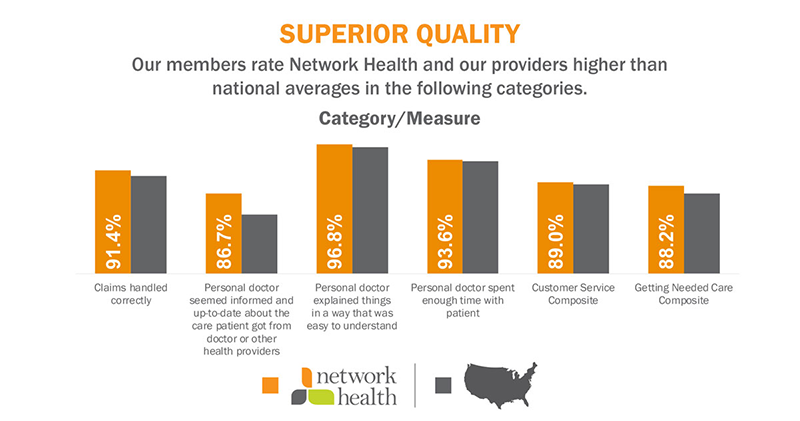 At Network Health, we understand the importance of quality health care and believe it should be convenient. As a member of the State of Wisconsin Group Health Insurance Program, you can choose your plan based on your health insurance needs. We appreciate your choice to be a Network Health member. 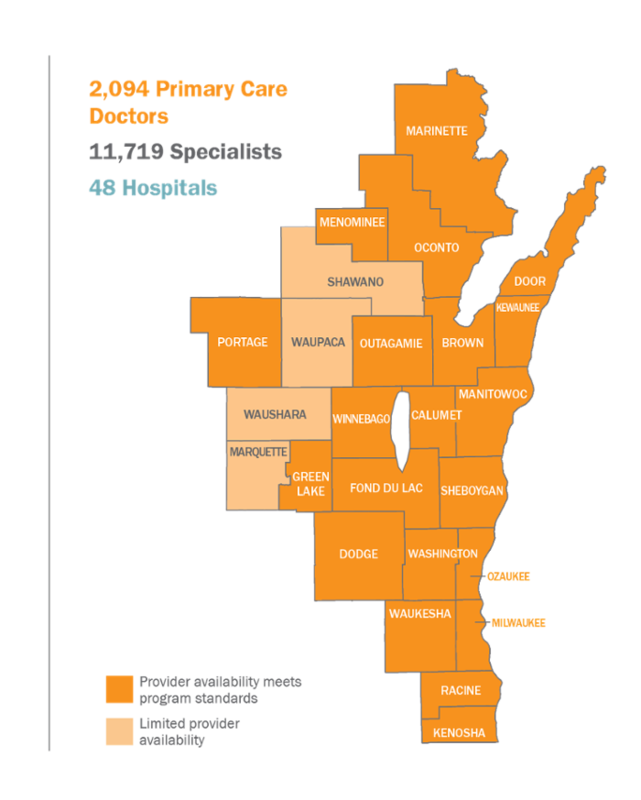 Network Heath’s provider network is combined across northeast and southeast Wisconsin. Our network includes the following high-quality health systems. Network Health has gathered and incorporated customer feedback to deliver a new member portal that’s centered around you. The new portal is easier to navigate to find information regarding your plan, benefits, claims and more. Plus, it's mobile responsive and viewable from any device at any time. The first time you access the new portal, you will need to create a new account. Visit login.networkhealth.com to get started today. See our How to Register cheat sheet for step-by-step instructions. The State of Wisconsin Group Health Insurance Program has a dedicated customer service line located in Menasha, WI. To speak with a specially trained Network Health representative call 844-625-2208 or 920-720-1811. Our representatives are available Monday through Thursday 7:30 a.m. to 5 p.m. and Fridays 7:30 a.m. to 4:30 p.m. You can email us a question by using our Contact Us form. We can also provide Language Assistance. To find an in-network provider, follow these steps. Go to our Find a Doctor search tool. Choose State of Wisconsin employees/members from the Choose a Plan menu. Follow the steps and enter in your search criteria then select Search. You can also view a PDF of the provider directory. If you would like a printed directory mailed to you, please call 844-625-2208. At Network Health, we believe in empowering you to control your health care decisions. You can see any in-network doctor without a referral, although select services require prior authorization. A referral is a written request from your personal doctor (also referred to as a primary care practitioner, or PCP), allowing you to see a specialist or receive specific medical services. Prior authorization (or prior approval) is the process of getting permission from Network Health to determine if a service, procedure, test or out-of-network provider will be covered by your insurance. Select services, procedures, tests and out-of-network providers require prior authorization before you receive care. You will receive written notification regarding the approval or denial of the Prior Authorization. If you are unsure if a service, procedure, test or procedure requires prior authorization or a referral, call customer service at 844-625-2208 prior to the appointment. If you are traveling outside the network service area and have a medical emergency that requires a visit to the emergency room or urgent care, get the medical care you need without worrying about your health insurance. Network Health will cover the cost of your visit, excluding any required deductible, coinsurance, or copayment. Follow-up care must be received from an in-network provider unless otherwise approved by Network Health. A trip to the emergency room is warranted if you experience an injury, a worsening medical condition or illness, severe pain, and/or you feel that your health is in danger if you do not receive care immediately. Call Network Health at 844-625-2208 or contact your personal doctor if you need help determining the appropriate level of care. You receive the services in a nonhospital-based urgent care facility and you provide Network Health notification within 48 hours of receiving the services. Call the Network Health Care Management Department at 800-236-0208 (TTY 800-947-3529) to provide that notification. Call Network Health at 844-625-2208 or contact your personal doctor if you need help determining the appropriate level of care. If you experience a medical emergency, seek medical care at the emergency room. Sometimes, you may have a non-emergency question or illness when your personal doctor is unavailable. When this occurs, you have two options for non-emergent care that is available 24 hours a day. Our free nurse advice line gives you access to a registered nurse that can help answer your specific medical problems–any time of the day or night. The nurse advice line can be accessed by calling 888-879-8960 (TTY 888-833-4271). Have a symptom like a sore throat, muscle pain or a fever. Have questions about your medications or are prescribed a new medicine and want to know more about it. Want more information on a health issue. Need help determining where to go for care when it's not an emergency. Virtual visits, brought to you through MDLIVE®, are a great way to save time and money when you experience non-emergency symptoms. By using your phone, smartphone, tablet or computer, you can connect with a board-certified physician or pediatrician for treatment of a wide range conditions. You can also get prescriptions filled, if needed. MDLIVE can assist with these conditions and more. You can activate your Network Health MDLIVE account one of three ways. Text NETWORK to 635483 or visit MDLIVE.com/networkhealth.com. Download the MDLIVE app on your smartphone or tablet. Open the application and follow the instructions to create an account. Call 877-958-5455 and an MDLIVE customer service representative will walk you through the process of setting up an account. We require prior authorization for autism treatment and all inpatient services for mental health, behavioral health or substance abuse services. For assistance, please contact Network Health’s Care Management Behavioral Health Department at 800-555-3616. After hours, call your practitioner or the Network Health Nurse Line. How do I assign/choose a personal doctor? There are two ways to choose or verify a primary care practitioner or personal doctor. Visit login.networkhealth.com Once signed in, select your name in the upper right corner to view your profile. Select Change my Personal Doctor and follow the steps that appear to select or change your doctor. Call our customer service department at 844-625-2208. How do I find an in-network pharmacy? Does Network Health cover my medications? Any medication that is used by a provider during a hospital visit or stay is covered under your Network Health medical insurance. Care management provides personalized coordination of care, access to care, identification of benefits and resources, and condition monitoring to help you get the health care you need, whether you’re dealing with a short-term illness or a more complex diagnosis. Care management begins with a one-on-one conversation with a care manager. If you choose to participate, you will work directly with a care manager to manage your health condition with the ability to opt out at any time by contacting the customer service number on your ID card. Care management is available at no cost to members. How do I transfer medical records? Complete a form from your provider’s office requesting the transfer of medical records. You may also contact your previous provider to request the transfer. Sometimes there is a fee for the collection or transfer of medical records. Premium- The monthly payment you make for your health plan. Copayment - A set fee you might pay for a type of health care or a prescription drug. For example, your copayment for a doctor visit could be $20. Once your deductible is met, Network Health pays the rest. Coinsurance - A set percentage you might pay for a type of health care or a prescription drug. For example, 10 percent coinsurance means you pay 10 percent of the cost. Network Health pays the rest.